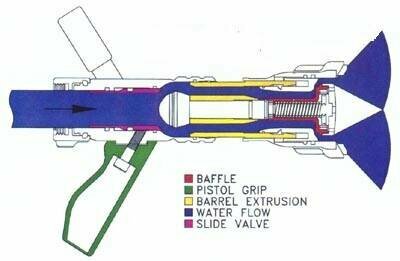 The smooth bore nozzle may be viewed by some as “dated” by some but if you take a little deeper look at history you can see some very sound reasoning in the smooth bore nozzle. The operating pressure of the smooth bore is a range from 40 to 60psi, with 50psi as optimal. This was important to our forefathers in the fire service as early pump systems were primarily lower pressure and could see significant fluctuations with more than one line being supported simultaneously. The solid stream and long tip provided accurate delivery of the fire stream at a great distance for firefighters with limited PPE. As technology advanced, our pumps were able to provide higher and more consistent pressures. Lloyd Layman and various others brought the fog nozzle into the American fire service, vendors started to develop automatic nozzles and before we knew it there was a shift from a 50psi fire service to 100. Over the last 15 to 20 years an increasing number of firefighters and departments are beginning to question what has been gained by doubling our nozzle operating pressures. In many cases it is being discovered that for the most part the only true gain has been nozzle reaction which simply equates to more work on the nozzle firefighter. There have been several studies done over the last 20 years into nozzle reaction and how it effects hose line operations. The goal of these studies has been to identify how much nozzle reaction firefighters can comfortably handle while still being able to effectively advance and manage a hose-line. A study by Paul Grimwood outlined three working limits; 1 firefighter (60 force/lbs), 2 firefighters (75 force/lbs), and 3 firefighters (95force/lbs). I have been fortunate enough to work with firefighters across the country on hoseline operations and I can tell you that with good technique, practice, improved fitness and continued work, firefighters can easily operate lines with nozzle reaction forces beyond the above working limits. However, these working limits are very accurate for the majority of firefighters and the median level of training. 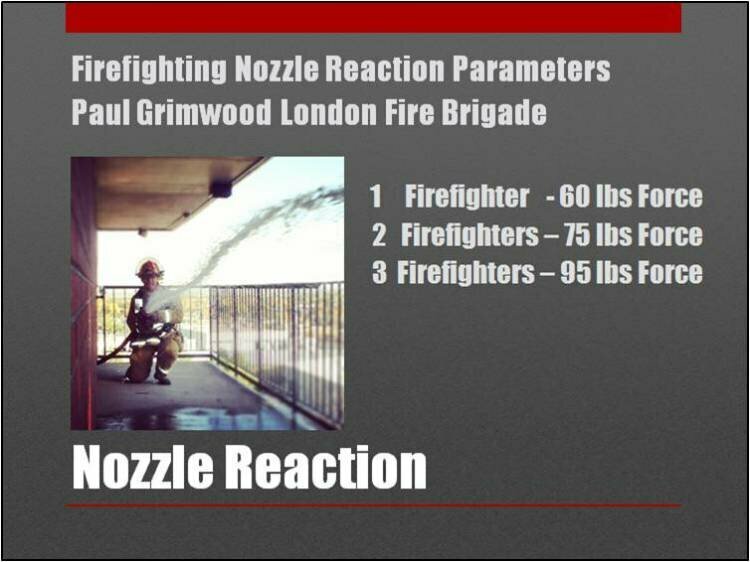 Nozzle reaction is the resultant pounds force push back of the combined volume and pressure leaving the nozzle. 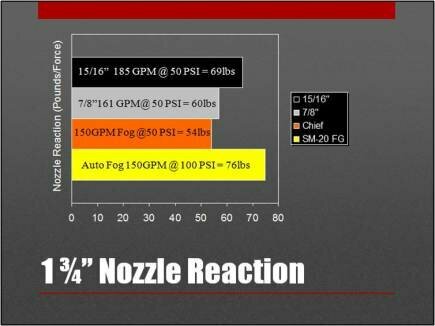 The only way to alter nozzle reaction is to alter the volume (GPM) or the pressure (PSI). Many people have used a variety of methods to demonstrate nozzle reaction like fish scales and rope but the actual force is calculated using the formulas below. As a rough rule of thumb the pounds force of nozzle reaction for a 100psi nozzle is ½ of the GPM. Why 150 GPM? Nationally, 150 GPM has become the target flow for 1 ¾” attack lines. This number comes from NFPA 1710 (Organization and Deployment of Fire Suppression Operations by Career Fire Departments). The standard outlines that the first two attack lines in operation at any residential structure fire flow a minimum of 300 GPM combined. With the NFPA wording you could flow 100 GPM with your initial line and 200 GPM with a second line but the common sense approach and now industry standard has targeted 150 GPM as an interior attack standard. At the end of 2005, following a full year trail period with a variety of nozzles the preference of our firefighters was the 7/8” smooth bore with a flow of 161 GPM at 50 psi and a nozzle reaction of 60lbs. What is key to remember is that nozzle ratings are just “ratings”, when closed all nozzles flow 0. A 150 GPM or 2.5 gallon per second nozzle may seem “inferior” to one that flows 185 GPM or 3 gallons per second. If the nozzle firefighter can comfortably flow that 150 GPM nozzle for 30 seconds at a time around a corner while actively playing it they are delivering 75 gallons to the fire environment. A nozzle firefighter that is struggling with a 185 GPM or 200 GPM nozzle, only operating it for 10 to 15 seconds at a time without fatiguing, and has poor stream movement is potentially ineffectively applying only 30 to 50 gallons to the fire environment at a time. Put the right weapon in your operators hands, it may not be the one with the greatest fire power.